Today is Volunteer Recognition Day and I want to recognize all those who have volunteered for Bucket Buddies over the last 2 1/2 years. We have delivered almost 5,000 buckets in 21 states and Canada! Today I have a call to set up our next big bucket delivery through volunteers at Hill-Rom and we are looking to add several more states and Mexico! Thank you to friends, family, 4-H groups, youth groups, churches, businesses and my Hill-Rom family – those I know, and those I don’t, from around North America! I am overwhelmed with your generosity to share in our vision to make a difference to children around the country who suffer from life-threatening illnesses! 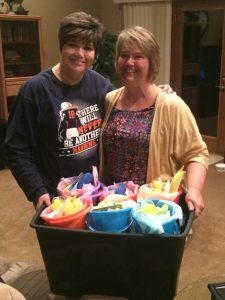 I want to highlight my friend, Beth Ann (Fisk) Mathes who sent me a message and asked to come over and help one evening just because! Thank you Beth Ann for all of your support for Bucket Buddies Mission and most of all for your friendship over the many, many years! See more pictures here of the hundreds of volunteers we have had since we began trying to make a small difference in July, 2014!! A round of applause for all of the volunteers around the world today and an extra special round for those who have helped us make this dream come true for Bucket Buddies!! This entry was posted in Uncategorized on April 20, 2017 by Deanna Young.